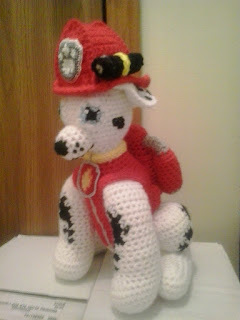 This is the first in a series of the original 6 Paw Patrol dogs. This is Marshall. He is the designed to portray a fire fighter. Marshall is Dalmatian. He, along with the other 5 Paw Patrol dogs, are a request from a co-worker. The others will be coming soon. Worsted weight yarn: White, black, red, yellow, gray, and light blue. DMC floss: Red (321), white, pewter (414), gray (415), orange (740) and yellow (444). Rds 6-9: sc in each sc around. (36) Change to red after Rd 8. Rd 30: (sc in next 3 sc, sc2tog) 4 times, sc in next 4 sc. (20) Change to white. Finish off leaving a long tail. Weave tail through sc of Rd 49, pull tightly and secure. Weave in ends. Using gray, surface chain stitches up front of shocking pink section for zipper. Rd 1: Attach gray floss and using Size 6 crochet hook in 6th sc of Rw 16, sc in evenly around outside edge with 2 sc in each of Rws 16 and 14 and 2 sc in center of foundation ch, slip st in first sc, ch 8, wrap around COLLAR, slip st in first sc of EDGING. Finish off leaving a long tail. Sew TAIL to BODY adding stuffing to create desired shape before closing. Rd 2: Ch 1, turn; 2 sc in next sc, 3 sc in next sc, 2 sc in next sc. (7) Change to white. Finish off leaving a long tail. Sew EYES to head of MARSHALL. Finish off leaving a long tail. Sew SIDE POCKETS to BODY adding a small amount of stuffing before closing. STUFF PUP PACK TOP FIRMLY. Finish off leaving a long tail. Stuff PUP PACK BODY firmly. Sew opening closed. Sew PUP PACK to BODY. Weave in ends. BEGIN STUFING PUP PACK SIDE CANISTERS FIRMLY. CONTINUE STUFFING FIRMLY AS YOU GO ALONG. Finish off leaving a long tail. Sew PUP PACK SIDE CNAISTERS to PUP PACK. Finish off leaving a long tail. Sew HAT BACK pieces together. 1. Sew BACK pieces together. 2. Holding BACK pieces and SIDE piece together and working through both thicknesses, sc along the side of the Rws. 3. Repeat Step 2 for other SIDE. 4. Sc together top of SIDES together. 5. Holding FRONT together with SIDES and working up and down sides of FRONT and SIDES, sc in each Rw. Rw 3: Ch 1, sc in next 8 dc, hdc in next dc, 2 hdc in next dc, 2 dc in next dc, 3 tr in next dc, 2 dc in next dc, dc in next 6 dc, 2 dc in next dc, 3 tr in next dc, 2 dc in next dc, 2 hdc in next dc, hdc in next dc, sc in next 8 dc. Finish off leaving a long tail. Sew HAT to PAW PATROL MARSHALL stuffing before closing. Finish off leaving a long tail. Sew HAT YELLOW RIBBON to HAT. Finish off leaving a long tail. Weave tail through sc of Rd 10, pull tightly and secure. Weave in ends. Finish off leaving a long tail. Wrap HAT CAMERA STRAP and sew together. Sew HAT CAMERA to HAT. Using graph above, floss, and Aida cloth, cross stitch PAW PATROL LOGO. Rd 1: Attach white crochet cotton and using Size 6 crochet hook in 6th sc of Rw 16, sc in evenly around outside edge with 2 sc in each of Rws 16 and 14 and 2 sc in center of foundation ch, slip st in first sc. Marshall and Paw Patrol are copyright Spin Master Entertainment and their respective creators.